In Francis Poulenc&#146;s Dialogues of the Carmelites, overcoming fear is the hurdle a young woman named Blanche de la Force must face in order to master her life. In this three-act, 12-scene through-composed opera, Poulenc follows this high-strung, aristocratic woman into a nunnery where she seeks refuge against fear that was viscerally transferred to her from her mother whose carriage was attacked by an angry mob. The attack triggered Blanche&#146;s birth and her mother&#146;s death. Based on Georges Bernanos&#146; screenplay by the same name which was completed in 1948 and which owes much of it&#146;s inspiration to Gertrude von Le Fort&#146;s The Song of the Scaffold, Poulenc in collaboration with Emmet Lavery created an insightful psychological adaptation that ends at the guillotine during the waning days of the French Revolution&#146;s Reign of Terror and with the martyrdom of Blanche&#146;s Carmelite community. Opera International of Washington, DC offered an outstanding production using a cast that featured many young singers with impressive resumes and abilities, a 37-member orchestra, and tastefully mounted minimal sets balanced with lighting effects that extended the scenery. One annoying aspect of the production was the English translation by Joseph Machlis whose text is initially loaded with double negatives and extra words. Surtitles made it easier for the viewer to understand the text, which as the opera progresses reveals many memorable lines. For example, the dying Mother Superior, the Convent Prioress who rigorously interviewed Blanche telling her the Carmelite Order is not a refuge from life but a house of prayer, confesses to her attending associate Mother Marie, &#147;I&#146;ve reflected on death every day of my life, but it hasn&#146;t strengthened me.&#148; Mezzo-soprano Kyle Engler as the Mother Superior offers a compelling interpretation of a nun who has lost her faith, fears death, and who clings to her newest novice Blanche whom the Prioress dubs a daughter of her old age. Another bright star in this cast is soprano Jane-Anne Tucker who shines as the odd country girl Constance who enters the convent just before Blanche. Constance tells Blanche that both of them will die on the same day and that she (Constance) had always wanted to die young. Initially Constance says life and death are equally amusing and musically Poulenc allows this character a light-hearted vocal trill given to no other character in the opera. Tucker delivers both song and acting with convincing abandon and when Constance, who first mocked the Superior Mother&#146;s pending death, must absorb the Prioress&#146;s actual death, she soberly tells Blanche that their Reverend Mother&#146;s death was too small. In the operatic7 drama, Constance serves as Blanche&#146;s foil. 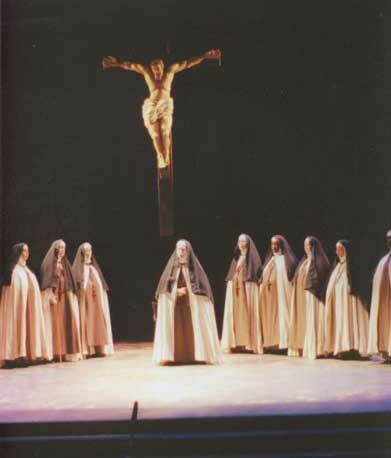 When the revolutionary officials tell the Carmelite Sisters that they must disband, Mother Marie (mezzo-soprano Kathryn Honan-Carter), who is acting in the absence of the new Prioress, proposes that they take a vow of martyrdom but based only on a unanimous vote. Initially there is one dissenting vote and the sisters suspect Blanche, but surprisingly Constance owns up to the dissenting vote and then recants. The sisters disband within the community wearing ordinary clothing. Blanche is dispatched to her father&#146;s house but works there as a maid. When Mother Marie comes to collect Blanche to stand with her sisters who have been condemned to die by the revolutionary tribunal, Blanche refuses to give up the illusive safety of her now-executed father&#146;s home. At the conclusion of the opera, Constance is the last sister dressed in a habit to approach the guillotine but, before she does, Blanche still dressed as a scullery maid rushes in, catches Constance&#146;s eye, and takes up her song. Constance&#146;s prophecy is carried out as Blanche marches courageously to the guillotine. Although one does not leave Dialogues humming any of the musical phrases, Poulenc creates a lyrical landscape of sound. The orchestra gets a lot of attention since it plays substantial interludes between the acts. Also the musical texture is surprising and varied. Instruments include a harp and many unusual percussive instruments, including a celesta, a piano-like instrument with a toy box sound which one might recognize in &#145;The Dance of the Sugar Plum Fairies&#148; from Tchaikovsky’s Nutcracker Suite. Opera International&#146;s orchestra, constrained by the small orchestral pit of George Washington University&#146;s Lisner Auditorium was forced to put some of the musicians and instruments on the side wings of the stage and to use an electronically created celesta. Another engaging aspect of Poulenc&#146;s musical menu is his sweep from what sounds like 1940&#146;s film music with it&#146;s eloquent flourishes in the first scene (a nod to Bernanos&#146; screenplay) to the haunting liturgical and medieval sounds of the songs of the Carmelite Sisters. If there are any regrets about this production by Opera International, it is that there were only two performances and that the company had to spend the remaining funds of its endowment to mount the opera. In the post 9/11 attacks on America, Poulenc&#146;s Dialogues of the Carmelites informs our thoughts about terrorism and fear as well as what we might expect in our future.